As a user experience designer, my objective is to design the best product experience by evaluating users’ needs and goals. I like to follow a user-centered design methodology by defining the scope of a design problem, doing user research to understand who the target audience is and how their needs align with the design scope, sketch and design concepts and ideate, create prototypes to test on users, and iterate based on user feedback. My specialties include design ideation, visual and interaction design, and prototyping. I currently work as a UX Designer at Moz. I focus on their SEO toolset, Moz Pro. I have had the opportunity to work at Iqvia (formally IMS Health) as a UX Designer, Amazon as an interaction designer for Fire Tablets and Amazon's Unlocked Phone project, Alaska Airlines as a usability analyst intern on the Alaska Airlines website and with REI as a student researcher. I completed my M.S. degree at the University of Washington’s Human Centered Design and Engineering (HCDE) evening Masters program getting a foundation in user-centered design and human computer interaction in June 2016. Outside of work, I enjoy spending my free time traveling to new places, hiking, backpacking, hanging out with friends, painting with acrylics and drawing. I’m working on being a more active writer, learning how to be a mentor, and learning the joys of being a first time home owner. If you are interested in learning more about me, download my resume or send me a message below! As a usability analyst intern, I worked with the Ancillary Revenue team to do research and help solve design problems towards building a better e-commerce experience for customers. I worked closely with the UX team and was able to participate in a variety of projects as well as conducting my own formal usability study. Analyze how competitors of Alaska present ancillary products within e-commerce websites. Produce various flow diagrams of booking process through Visio. Take notes during formal usability studies at Seatac Airport. Assist the UX designer on my team with visual design tasks. Create my own formal usability study using usertesting.com. Present findings of my usability study to E-commerce and UX teams at Alaska. Alaska Airlines was going through a brand refresh, which included updating their website. The current experience felt cold and outdated. 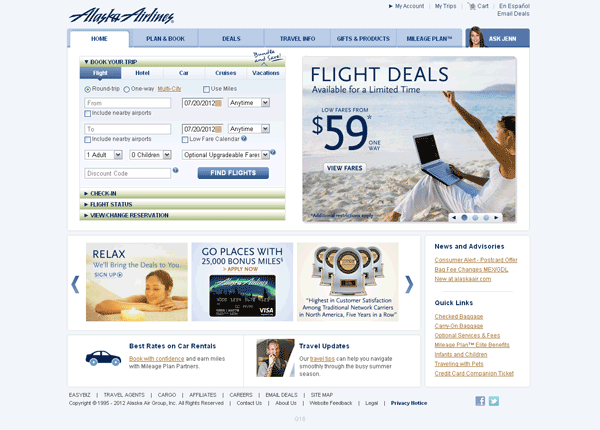 Alaska Airlines website prior to redesign. When I came in as an intern, the UX team had been working with Artefact, a design consulting firm to investigate how they could redesign their website. My task involved taking a closer look at the proposed designs and investigating how Alaska's target audience would respond to this new website. I began my internship by doing a large competitive analysis on other airline websites. I measured the friction of the ticket buying process by creating flow diagrams and looked at how other airlines sold ancillary products to their customers. Over the period of the investigation, I noted that the best experiences strived to create a sense of inspiration for travel for their customers to help ease the process of booking a trip. The strongest example of this was the Airbnb website. To my surprise, I found that the design for Airbnb's website was very similar to Artefact's proposed design. Airbnb's site was welcoming and told a story through it's immersive imagery and suggestions for travel. I decided to conduct a formal usability study on Airbnb's site to identify the positive and negative aspects of the overall design as well as discovering how users go through the process of picking their final destination based on discovery and inspiration. 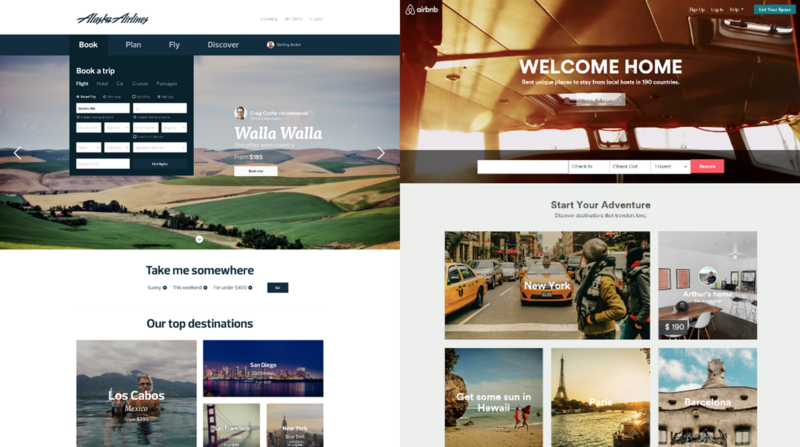 Comparison of proposed design for Alaska's website and Airbnb's website. I worked with my project manager and a business analyst to create a usability study. The study would be conducted over usertesting.com with 10 participants. The study was broken into two groups. Each group completed four task; the first three were the same and the final task investigated different sections of the website. Once the study was complete, I reviewed the videos and analyzed the data that was collected. I created a final presentation which I presented to the directors of the information technology division of Alaska Airlines. All 10 participants really enjoyed their experience with Airbnb. Many stated it was a refreshing way to plan for a vacation. ​The most liked feature among all 10 participants was the imagery. The imagery was considered unique, engaging, and inspiring. ​Participants commented on the fact that the images did not feel like stock photos and many felt their experience was very personalized to their interest. ​Almost all of the participants would begin their search relating their interests with the location they are researching. Looking at actual user data and seeing participants interact with Airbnb really helped strengthen the case for redesigning the Alaska Airlines website. It was clear that the new proposed design could inspire customers to use Alaska's website as a gateway to planning their vacation. If you are interested in viewing the full presentation, you can view it here through OneDrive or view the PDF.